SCOTLANDVILLE–Food deserts are a significant problem for East Baton Rouge Parish, with between 75,000 and 103,000 residents living in food desert neighborhoods. Defined as an urban area in which it is difficult to buy affordable or good-quality fresh food, there are seven food desert areas in East Baton Rouge Parish including Scotlandville, Downtown / Old South Baton Rouge, South Baton Rouge, Zion City / Greenwell Springs, Mid City, North Forest / Red Oaks and South Sherwood Forest / I-12 & Coursey. Most of the areas listed are populated by low-income residents, seniors and Blacks. Last February, Mayor-President Melvin “Kip” Holden and Together Baton Rouge created The East Baton Rouge Food Access Policy Commission to develop recommendations for policy change to address food deserts in East Baton Rouge Parish. In establishing the course of action the commission was able to identify eight key findings to initiate means of getting good-quality and affordable food to EBR residents in the food desert areas. The findings also proves that there are significant negative consequences for residents living in food deserts, including a strong correlation between a lack of grocery stores in a neighborhood and obesity, substantially higher costs of food, and a detrimental effect on the economic development of neighborhoods. In efforts to succeed in addressing the problem of food deserts, East Baton Rouge Parish determine the need to develop stronger retail attraction capacity targeted toward low-income areas, which required expanding its economic development strategy beyond a focus on regional business attraction alone to include a focus on fostering commercial development specifically in low-income neighborhoods. Through the Mayor’s Healthy City Initiative, the Scotlandville Mobile Pantry (a project of Together Baton Rouge and the Greater BR Food Bank) was created, Red Stick Mobile Farmers Market (a project of BREADA) was launched, and the Healthy Corner Store Initiative by the EBR Redevelopment Authority was initiated. Most of these initiatives are an outgrowth of Fresh Beginnings Project, a joint venture of seven partner organizations under the Mayor’s Healthy City Initiative, which was a 2012 recipient of a three-year Challenge for a Healthier Louisiana Grant funded by the Blue Cross and Blue Shield of Louisiana Foundation. On Aug. 19, the Scotlandville community was re-introduced to Sewell’s Community Grocery, 469 Elmer Ave., the first of the healthy corner stores in the initiative. But months later, the question begs, is this the only way people are getting fresh food? And what about areas that haven’t gotten stores yet? Sewell’s Community Grocery is one of four Baton Rouge neighborhood stores participating in the Healthy Corner Store program. By providing incentives for small retailers to sell fruits and vegetables, the program’s goal is to reduce the city’s food deserts where residents don’t have ready access to grocery stores. The three other stores participating in the Healthy Corner Store Program are Kelly’s Meat Market, 7744 Plank Road, Spanish Town Market, 701 Spanish Town Road, and Beechwood Meat Market, 4850 Beechwood Drive. Funds for the Healthy Corner Store Program came from a $1 million grant that the Blue Cross Blue Shield of Louisiana Foundation awarded to the Mayor’s Healthy City Initiative. Fighting obesity is one of the four priority areas of the Mayor’s Healthy City Initiative, and increasing access to fresh and healthy foods is a strategy that can help individuals make healthier choices about their diet. 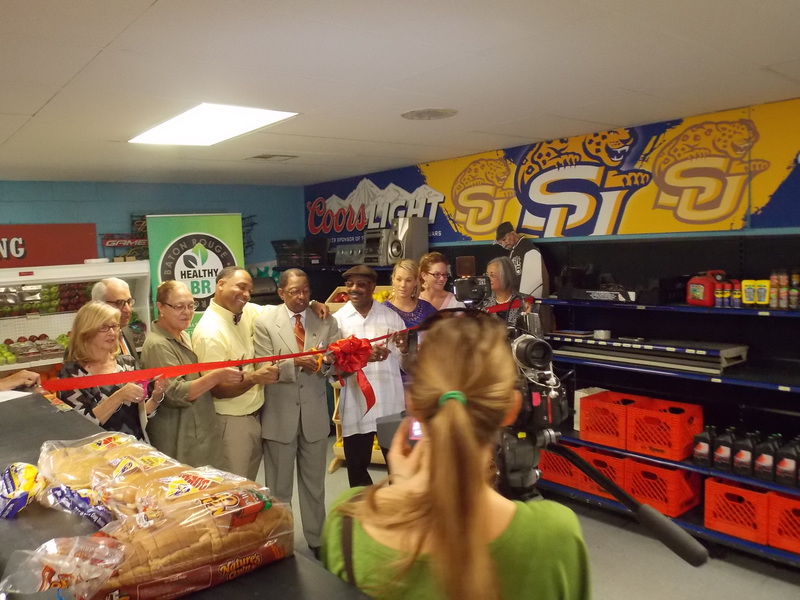 The Healthy Corner Store is administered by the East Baton Rouge Redevelopment Authority (RDA), which spent about $16,000 on each of the four stores, buying equipment such as bins for fruits and vegetables, refrigeration boxes and new cash registers to track produce sales. The RDA also gave the stores $500 toward the initial purchase of produce. And for residents who cannot afford to purchase the fresh food, initiatives to provide no-cost fruit and vegetables for individuals who qualify are available through The East Baton Rouge Food Access Policy Commission upcoming initiatives. There will also be a full-service grocery store, Matherne’s, opening up January 2015 in downtown Baton Rouge, walking distance from three current food desert areas. Major strides are occurring in the Capital City, but there is still more work to be done. No word yet on when the second phase of plan implementations will begin.